For no particular reason, it's Nissan Week here at Nice Price or Crack Pipe, and today's Forecast calls for BRE-Z weather with a chance of a localized high pressure zone. Okay, first things first, this is NOT a real BRE 240Z - probably - but it does play one on TV but the paint under the primer would still likely make Pete Brock bristle at the sight. 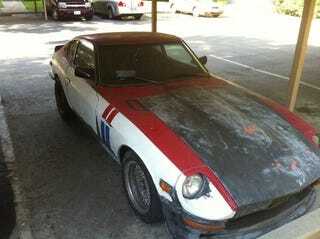 The seller claims that when he took possession of the car it was painted over in primer. He's been wet sanding that off, discovering the Brock livery underneath, much like a restorer may carefully clean away years of dirt and grime from the Mona Lisa, only to discover underneath that she's really John Morton. In addition to the bigger motor, this Z comes with a bunch of replacement parts already in place, including an aluminum 3-row radiator, new exhaust, some sort of leather seats, basket weaves, a new windshield, and 4 Wheel disk breaks. That last item may mean you should keep your old CDs away from the car. Inside, it's half-way between fright pig and daily driver, the scariest part being the Grant GT steering wheel dog turding up the rest of the cabin. The seats don't look out of place, but considering what you're expected to steer the car with, you might want to check them out for DOT certification. There's no radio to distract you from the engine's burble, and the instruments have been poked out and replaced with aftermarket parts. Of course the A-pillar is festooned with boost and other gauges because. . . well, where else are you going to put them? Back to that body, despite the BRE paint under the primer, the car really needs to have an audience with the Earl of Scheib, most notably for the driver's side fender, which is eff'd up. The seller says he took a stab at bondoing it, but dude, if you can't manage to focus a video camera, you're probably not going to have mad bondo skills either. On top of chipping off ten pounds of bondo and fixing or replacing the fender, you'll also need to TIG up the hole in the passenger-side floorboard, which likely presently provides ladies and kilt-wearing Scots with a good bit of flow-through ventilation for their nether regions. Okay, so this Z runs and is a blue plate special, sporting its original California tags. Plus it rocks both a turbo 2.8 and a 5-speed stick. Sure it looks a little like Mad Max gone SCCA, but the basics all seem to be there, and the aesthetics can either be fixed, or left alone as a middle finger in the face of conformity. But is that ability to flip conformity the bird worth $5,000? As a point of reference, you could alternatively grab this non runner for $2,800. But back to this Z, is this stripper worth the five grand cover charge? Or, would the seller need to shave off a couple grand along with the primer? Stockton Craigslist or go here if the ad disappears.